If you’re using a full rainwater harvesting system, when there isn’t enough rainfall to keep the tank full the system will automatically take water from the mains, so a lack of rainfall will make no difference around the house. How much water can be saved? This will depend on a few things such as the total area of the surface you’re using to catch water (probably the roof of your house) and how much it rains where you live. You’ll probably harvest a little more in Manchester or Wales, and a little less in Norfolk or Kent. On average, a domestic system will cut your domestic mains water consumption by about 50%. This can rising to around 80% for commercial settings such as offices or nursing homes. .
Why should I buy a system? Rainwater harvesting has some significant environmental benefits, cutting mains water demand and lowering storm water run-off at the wettest times of the year. Controlling your storm-water run-off is ever more important in the eyes of Planning departments, and rainwater harvesting can go a long way in tackling the issue. Is rainwater harvesting only for new buildings? No! The systems are best when incorporated into the design from the beginning, but they can be retrofitted to existing homes and other buildings. Is there a danger of Legionella? Legionella can’t cultivate in the dark, cool, and well-oxygenated conditions of an underground tank. How big are the systems and storage tanks? This varies quite a lot, and it depends on the harvesting capabilities of your roof as well as the likely levels of use of non-potable water in the house. Will I need to look after my rainwater harvesting system? This will vary from one system to the next, but it is always minimal. Typically, you’ll only need to wash off the filter with a garden hose for five minutes once a year. Underground tanks of the system will last indefinitely, 50 years woudl not be uncommon. The control system, pump, and filter all have very long life expectancies and are very easily replaced if needs be. How long have we been using harvesting rainwater? The Europeans began using the first rainwater harvesting systems way back in Roman times, but the systems we use today are based on designs from the mid-1980s. Is the modern technology proven to work? Yes, it is. Systems fitted in Germany in the 1980s are still in use, and one benefit of the UK being so far behind the rest of Europe is that the potential issues with the systems have been worked out through all of the extensive work done in Germany over the years. How often will the rainwater harvesting system need to be topped up from the mains supply? A good system with a good balance between supply and demand should only need to be topped up when it hasn’t rained for a while. Severn Trent monitored a domestic system and found it rarely needed topping up and was usually around 50% full – ideally balancing having enough water to use and enough space to hold the next rainfall. Harvested rainwater is suitable for all non-potable purposes from watering the garden (your plants will prefer rainwater to mains water), washing the car, flushing the toilet, and running the washing machine. In some cases additional treatment can make the water safe to drink. How much does a pump cost to run? A pump will ordinarily use less than 1.0kWh of electricity to provide 1 cubic metre of water (1,000 litres). Pumping costs would be around 10p per week for a 3-bed house using rainwater for WCs, gardening, and running the washing machine. 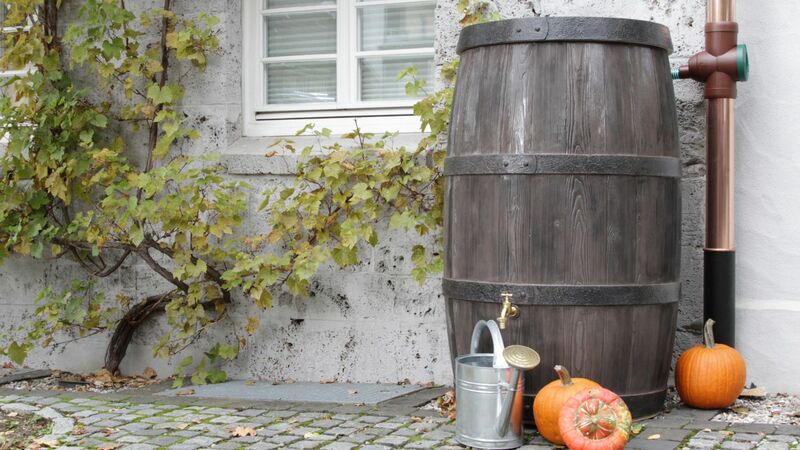 Smaller water butts used for gardening or washing cars will be a lot cheaper, but good quality larger domestic systems come in at around £1500 to £2000, depending on size. Commercial systems will be more expensive, but will save more due to the bigger roof areas. Can I drink the rainwater? In the UK, rainwater isn’t often harvested to be drunk. However, some manufacturers can offer solutions to bring water to potable quality with regular maintenance. Are there any rainwater harvesting grants or tax allowances I can claim for? At the moment, no. But rainwater harvesting systems do qualify for 100% capital allowance in commercial applications.